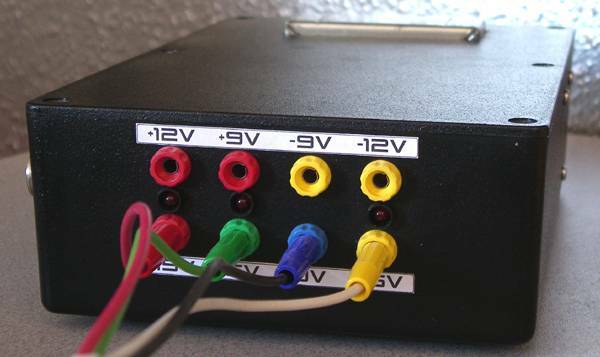 I built this PSU to power my breadboard where I play around with new circuits and ideas. Initially it had only +/-15V for analog and +5V for digital stuff, but then I was working on a project that needed +9V so I added +/-9V and +/-12V to hopefully cover all my future needs. 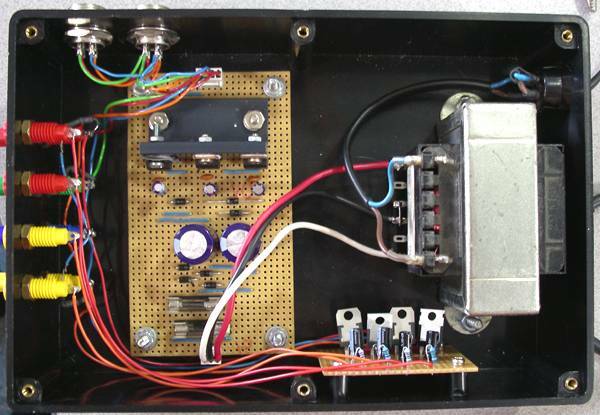 It's a simple design using standard 78xx and 79xx series fixed voltage regulators. The voltages are not high-precision but it's good enough for my purposes .. if I need a really precise reference (e.g. for a DAC or a VCO core) then I wouldn't use the power rails anyway. As you can see below there's a chunky transformer (2 windings, each rated at 20V / 1A). The original +/-15V and 5V board is the one in the middle and has heatsinking. The little board on the side gives the +/-9V and +/-12V outputs - this has no heatsinking because I will probably never draw that much current from these outputs and also it takes its input from the +/-15V lines so some of the power is dissipated by the heatsink on the main board.